I know this is true because of the quality of philosophy students in my classes. They learn how to think which is very important in this world. There is another way of taking these figures - that instead of people going into philosophy and getting much smarter, it is the smarter people who go into philosophy. Given business and other 'vocational' subjects are traditionally low status, more able students would prefer not to go into them. 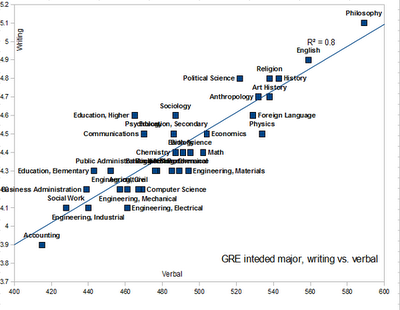 This makes the graph not such a good 'sales pitch' for philosophy - although smarter folks are more likely to go into it, that doesn't mean doing it will improve your GRE etc. If you buy the 'signalling' theory of education, then the assertion that 'go do a business degree to make you more appealing to business' gets it completely backwards. You are getting a degree to signal how intelligent/conscientious/hard working you are, and so higher status degrees are a much better strategy of getting a good job than getting a 'vocational' one. 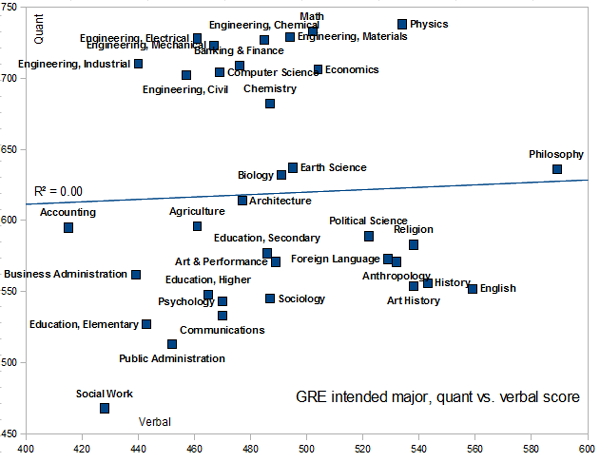 this might explain why Big4/IB/Mgmt consultants tend to hire lots of humanities (inc. philosophy!) 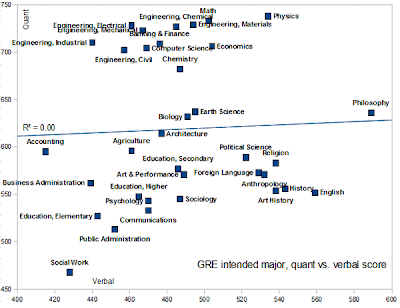 and science grads at prestigious institutions over folks with business degrees. "Of course, as the new business-friendly, market-led Tory vision of degree provision kicks in, we'll probably see philosophy departments up and down the country closing and business administration degrees expanding. Brilliant." Well, if what you say in the article is true, the exact opposite will happen. If philosophy leads to people who are more talented in both quantitative and verbal abilities, then they will do better in the job market, leading to an increase in demand for philosophy undergrad courses. So why are innocent people always convicted, should cops be forced to study philosophy? Click here, re above comment. I have taken the data here and worked out average IQ scores by intended major. Check out my graph and comment please. Feel free to be brutal. @Dr Law -- If you read this comment then please do comment on my graph and feel free to use it as ammunition for promoting philosophy. Thanks very much ShahHussein - I'll give it its own new post. Higher studies would bring pride to self, if it is studied from a reputed university either in India or abroad. Thanks for sharing this.